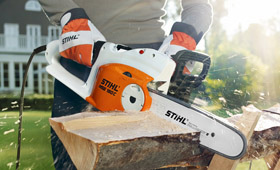 With STIHL electric saws, doing chain saw work in noise-sensitive environments or indoors is no problem. These machines with high cutting performance are quiet, exhaust-free and easy to use. Additional features such as Quick Chain Tensioning (B), QuickStop Super chain brake (Q) and overload protection provide greater operational comfort. For clean performance without much noise and exhaust. Transform blocks of wood into hours of fireside relaxation. Doesn’t hold back on power.